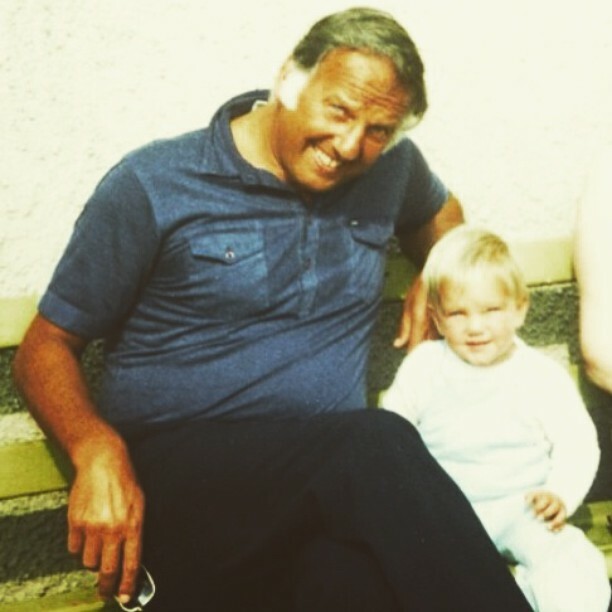 “I am running the Manchester Half Marathon on Sunday 16th October in memory of my Dad, David Ilgunas, who lost his fight with heart disease 8 years ago at the age of 70. We have a history of heart disease on my Dad’s side of the family so there was always a risk that he might encounter heart health problems. He was also a smoker which obviously increased his risk of heart attacks and debilitating health. I believe my Dad would have lived a much longer and healthier life if he had never smoked or if he had at least managed to quit. The smoking alongside with heart disease meant my Dad also suffered from pancreatitis, glaucoma, partial deafness and eventually kidney disease. My Dad just got on with life though and even after being told he’d be dead within 5 years if he didn’t quit smoking he surprised everyone by continuing on for far longer than expected! He was a toughie and didn’t let anything stop him. In 2003, Dad started having episodes where he would pass out for anything between 1 – 10 minutes; he would often clutch his heart as if having a heart attack. It was very scary and I remember it happened a couple of times whilst I was on my own with him. I remember just feeling helpless as there was nothing I could do apart from call 999 and hope for the best. The worst episode he had was one December (two days before Christmas Eve) where he passed out for almost 15 minutes. When he eventually came around he did the usual thing of saying he was fine and being the stubborn soul that he was, he refused to get in the ambulance. “If I go in that ambulance I will end up spending Christmas in hospital and I don’t want that! I’m fine now anyway.” He did make us laugh although I don’t believe he always made the right choices. I always remember my Dad’s disdain when his driving licence was taken off him as he was unfit to drive. He loved going to the pub for lunch on Wednesdays and he felt like he’d lost his independence. Eventually, the doctors put an Insertable Cardiac Monitor (ICM) device inside him in order to monitor his heart and try and discover what was causing him to pass out. It turned out that he needed a pacemaker as his heart was just stopping. My Dad felt like a new man with this pacemaker and the first thing he did was contact the DVLA and get his driving licence back! He carried on quite happily for 5 years, still suffering from pancreatitis, glaucoma, failing kidneys and deafness in one ear but he seemed to be going strong. In 2008 he was diagnosed with a hernia and although removal of a hernia is quite a standard procedure when your heart that only functions at 25% any operation is a risk. Dad pulled through the operation but then his kidneys finally gave in and he had to be put on a dialysis machine. He seemed to be ok and then that night his heart and body finally gave in and he gently passed away in his sleep. 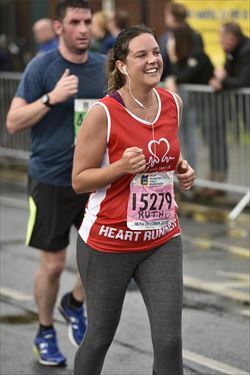 If you’d like to help Ruth reach her target and also help the BHF to fund more vital research, you can donate via her Just Giving page HERE. I am delighted to report that I ran the Manchester Half Marathon very successfully on Sunday 17th October in memory of my Dad. I completed the race in 1 hour 59 minutes which, as a novice runner, I was really proud of! The weather on the day was absolutely miserable as it rained for the first hour, but then as I reached mile 10 the sunshine came out which was lovely. I crossed the finish line just before my target time of 2 hours whilst I had the sun on my face and a cheering crowd all around me. It was an emotional and very proud moment which will stay with me for a long time. The support from the local community, the BHF supporters and the volunteers helping on the day was absolutely amazing and really made the course a joy to run. I had a smile on my face the whole time! There wasn’t a stretch of the race where there wasn’t someone cheering you on, handing you jelly babies or offering free high fives. It really was a great day and I have raised over £350 already for the British Heart Foundation. Thank you to everyone who has donated, offered advice, given me running tips and encouraged me throughout my training.